Floyd Mayweather Jr. is willing to work with Manny Pacquiao but not to fight him again. The senator called him to a rematch after his impressive victory against Argentine Lucas Matthysse. "I can't knock Manny Pacquiao for what he wants to do, that's his prerogative," the undefeated retired champion told Fighthype.com. "If he still wants to go out there and make money, be victorious that's his prerogative. You do whatever you want to do. 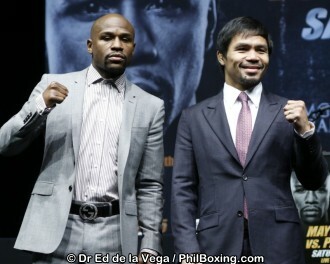 I don't have nothing against Manny Pacquiao." Since Pacquiao is no longer connected with promoter Bob Arum, the American former pound-for-pound king declares he can help his one time arch rival. He could not blame Manny for calling out his name because fighting "Money" means a lot of money. "Of course, he's supposed to call the Mayweather name. I'm probably going to be one of the biggest names of all time in this sport, if not the biggest name. When you call the Mayweather name out, I mean, you speaking dollars," says Floyd. He said a lot of reporters are asking if he is afraid of the Filipino boxing icon. "I'm not really doing interviews but I've been asked the question probably seven times, with one saying, 'why are you scared to fight Pacquiao' - like beating him once wasn't good enough." Mayweather added that the eight division world champ is an exceptional fighter but he considers himself the best. "It is was it is and Pacquiao is a future Hall of Famer, a hell of a champion and a hell of a guy. But the best man won and I was the best man." He said he could get in touch with Manny and help him come up with a good fight. "Actually, I'm [going to] get on the phone with Pacquiao after this call see if we can put him in position. There's a lot of good competition out there that he could fight." Mayweather recommended that Pacquiao would face Mikey Garcia, who recently unified the IBF and WBC lightweight titles on July 28 by dropping Robert Easter and winning by unanimous decision.